Wireless mouse makes the use of computer much more comfortable compared to a wired mouse. 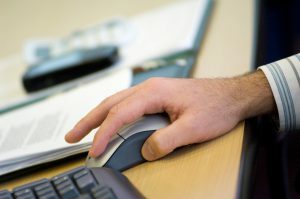 A mouse cord can limit a users’ hand movement. Choosing a wireless mouse, however, can be confusing. There are so many decisions to make. A Bluetooth mouse or a mouse with a USB port? A mouse with batteries or a charger? It can be stressful to choose the one right for you. 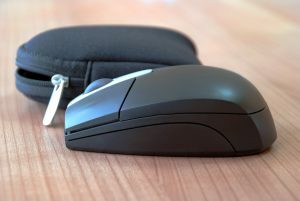 In this article, we want to introduce you how to choose a mouse based on price, function and customer reviews. We will give you our top 10 choices in a ranking style. The list includes products from popular companies like Microsoft, Logitech, Lenovo, HP etc.. to products that are stylish and attractive. You might find the perfect one for you on our list! So, let us explain the tips on how to choose the right one for you. How it fits in your hand is important, yes, but there are other points to examine when you are looking a variety of choices. 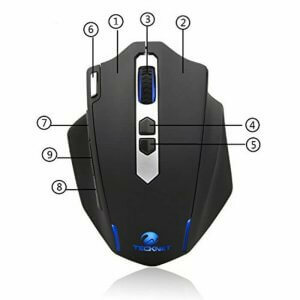 It is important to know features of a mouse and what would be the most important feature in catering to your needs. When you are looking at a “wireless” mouse, you need to know there are two types of connection. One is connected by the sensor and the other connected by Bluetooth. First, let us explain the difference between the two and so you can find out which would be best suited for you. This mouse type requires a specific receiver that comes with a product. You will use a USB port on your computer as a sensor receiver. There is no need to do a complicated setting, yet, it has a maximum working distance of approximately 10 m. You will be able to use it from more than a few steps away from your computer. One thing to remember is that you cannot use this type without a sensor receiver. This means one of your USB ports will be taken up. 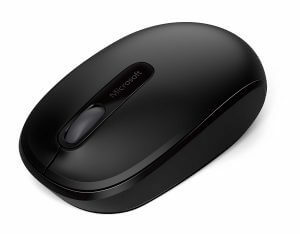 If your computer has Bluetooth built-in, you can use a Bluetooth wireless mouse without using a sensor receiver. This type is highly recommended if your computer has limited USB ports. Another advantage is that it can be connected to Android phones and tablets. It requires one extra step unlike the one with sensor connectivity, which is connecting a mouse to your computer. And even if your computer does not have built-in Bluetooth, it is possible to use this particular type if you use a receiver for it. To connect a wireless mouse to a computer, it requires power source on a mouse’s end as well. 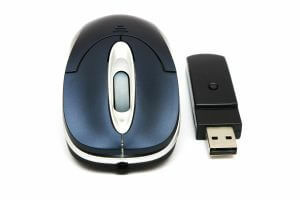 There are mainly two types of the power source to wireless mice: battery operated or rechargeable battery operated. A battery-operated mouse needs either AA batteries or AAA batteries. A mouse will stop functioning once it runs out of batteries, of course. So, don’t forget to stock up spare batteries in advance. A mouse with a charger has a rechargeable battery built into a mouse. A USB will charge a mouse, and there is no need to purchase additional batteries. For this reason, it is cheaper to purchase this type in the long run. Wireless mouse’s reading accuracy depends on what kind of technology it uses. It is important to know each type and which type is best for you. Some wireless mouse does not work well on certain surfaces. Here, we will introduce and explain four different types of reading technology. 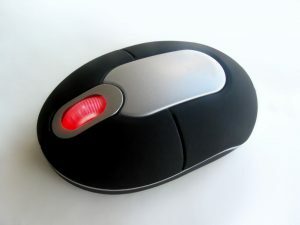 This type of wireless mouse emits red light, and this technology is used in relatively inexpensive mice. The accuracy of Red LED is average. Some surfaces might not work well. For example, surfaces in white color and/or with reflective materials like glass or plastic film coating might lower the mouse reading accuracy. A mouse pad is a must-have for a Red LED mouse. A laser mouse has better accuracy in reading than an optical one. You cannot look directly into the light. Even on a reflective surface or an uneven surface, it can work with good accuracy. However, it will not work on a transparent glass surface. On this particular surface, you will need a mouse pad. It is also relatively pricey. Another thing to keep in mind is that a laser mouse has a high(long) lift-off distance. Lift-off distance is how high you have to lift your mouse in order to move your mouse into the best position without moving a cursor on a computer screen. 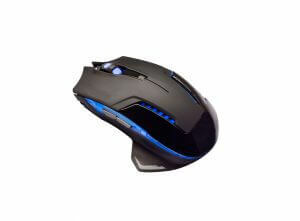 Reading accuracy for Blue LED optical mouse is very high. Its illumination is blue. It works on a variety of surfaces. On reflective surfaces like glass, plastic film coating, on white or even on fabric, this technology enables smooth motion. It can track fine texture and dust. 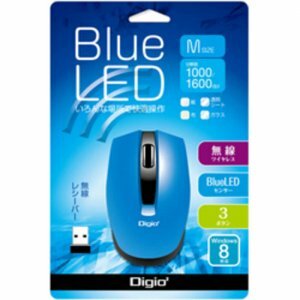 A blue LED mouse is a bit like a hybrid version of an optical wireless mouse and a laser one. The only tricky surface is completely transparent glass. The motion sensor does not work too well on transparency. Make sure to use a mouse pad. IR LED mouse consumes the least energy. Once you put new batteries, you don’t have to change them for approximately one year. Please note that you cannot directly look at the light. Its reading accuracy is similar to that of an optical wireless mouse. We all spend many hours holding our computer mice. It is very important to find the one that fits your palm perfectly. Long hours of gripping an ill-fitting mouse can wear out your fingers and wrists. 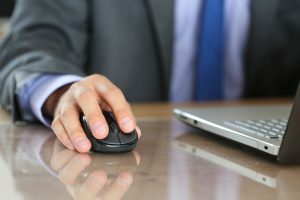 Your hand size as well as how you hold a mouse can determine which mouse works the best. We recommend that you try out in person. Nowadays, you can find ergonomic wireless mouses that are designed to fit well in human hands. These mouses are made for either a left or right hand, and they are not interchangeable. Make sure you choose the right one. Another thing to check in person is the sensitivity of a mouse. Does it move smoothly when clicking or scrolling up or down? If unable to try it out in person, it is always good to check customer reviews. If you require precise movements like gaming, make sure you choose a mouse with high sensitivity. A mouse’s sensitivity is measured in DPI (how much a pointer on a screen moves when a mouse moves an inch). If you are simply doing an ordinary task like browsing the Internet, 800 to 1,600 DPI would suffice. This is something you should think about if you want to travel with a mouse as well as a laptop. How thick/thin and light a mouse is might be an important point in this case. One thing to keep in mind is lighter the weight, harder to control a pointer of a mouse in general. There are mice with extra features that you might find useful. Check to see if any feature can work well for you. A basic mouse has two buttons on left and right sides and one scrolling wheel. However, there are mice with extra buttons. Each product with extra buttons offer different functions like “forward”, “backward” and “search”. Depending on a mouse, functions of extra buttons are different. Make sure to check the features to meet your needs. This feature allows you to scroll left and right by tilting a wheel of a mouse. You don’t have to use the on-screen navigation to move horizontally. It is handy for people who work on spreadsheets in Excel. All right. Now, we will take a look at the top 10 wireless mouse. We are listing different types so you can find the one that matches your needs! This award-winning wireless mouse by Microsoft will blow your mind. In use, it curves for your palm to fit with ease and comfort. And when you are done, you can flatten it out so that you can slip it into your pocket or bag. This is a bit big for a small hand and expensive. But it has high sensitivity and works well even on textured surfaces like wood and carpet. If you are on business tour and required to do a presentation, then don’t be worry about the surface you will be using on. It is used with a USB port. This Microsoft Wireless Mouse 1850 is ambidextrous design so that it fits both left and right hands. And its compact size can be friendly to almost anybody’s hand. Many people commented on durability and lightness. It is perfect for taking it outside the office environment. One thing to note is, its clicking sound is on the louder side than other products. It requires one AA battery. It is connected with a USB receiver, so make sure you have enough USB ports to spare. This moderately priced mouse is perfect for a variety of basic computer navigation. 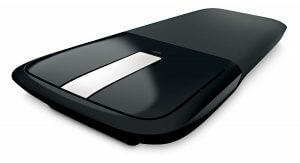 This very popular Logitech wireless mouse does not betray its name “Anywhere 2”. It can track anywhere, even on glass and highly reflective materials. One of the main attraction to this mouse, is dual connectivity. You can either use sensor connection or Bluetooth connection. Another pro for this item is it can connect up to three different devices. It is perfect for someone with multiple work devices. Yes, this mouse is not cheap at all. But, it comes with so many features like extra buttons to customize to your needs. If you need a versatile and highly functional mouse, this might be your choice. 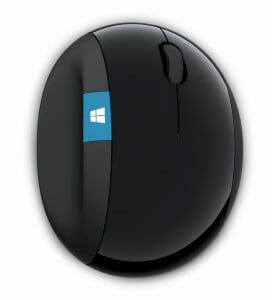 This ergonomic mouse by Microsoft is perfect for someone who uses a mouse heavily. It is designed so that your wrist comfortably sits on it, reducing the risk of pain and injuries due to repetitive motions. It requires 2 AA batteries. It also offers features like four-way scrolls and a back button for faster navigation. And the window button on top provides an access to the Start screen. Anyway, you look at it, it is a must-have if you use your mouse professionally at home. 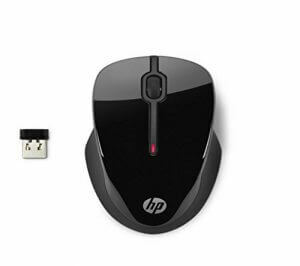 This HP X3500 wireless optical mouse that connects with sensor has three DPI settings 1000/1200/1600. It is enough sensitivity for a variety of tasks from browsing the Internet to simple gaming. “Cheap and easy settings” are the theme of positive reviews. This means it is user-friendly, and won’t be intimidating even if you are not a computer wizard. A couple of things to note. It is fairly light and could be a bit big for a small handed person. Make sure to compare the size of your current mouse. It is 1 AA battery-operated and it will last up to a year. 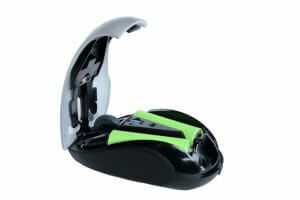 This stylish ergonomic wireless mouse from TechNet has special 6 button design with comfort-grip side zones. It has a tiny Nano receiver which means just plug & play so there’s no software to install. 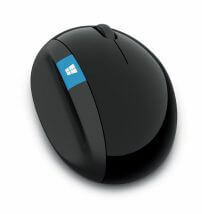 In addition, this mouse has a Tru-Wave motion sensor, so you can use on almost any surface including reflective or transparent surfaces such as glass. Also, it is small in size so very suitable for the traveler. It comes at very affordable price. If your work requires giving presentations often, this might be the product for you. 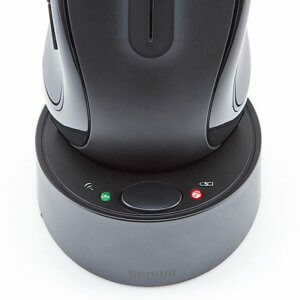 This Bluetooth mouse has a dual mode and switches to a curved mouse to a presentation pointer by twisting to either mode. It also has dual connectivity. 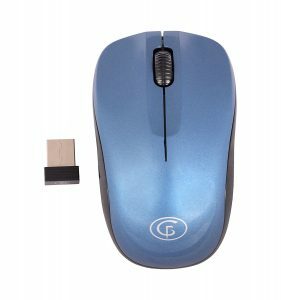 You can either use Bluetooth or a USB port that comes inside of the mouse. 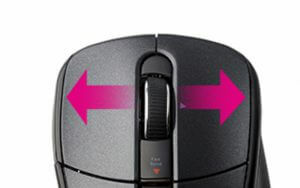 This will allow you to connect the mouse flexibly depending on the environment you are using it. Light, thin and portable with a laser pointer, this is the mouse to use if you are traveling a lot. This product came in #3 on our list not only because it is affordable, but also its unique smallness. This pocket-size wireless mouse sure will fit in your palm and great for children who are learning to use the computer as well. It is a USB port and required 1 AAA battery (pre-installed) and 3-year manufacturer’s guarantee and full product support. This is best recommended for a traveler that allows you to travel lightly and could even fit into a handbag. 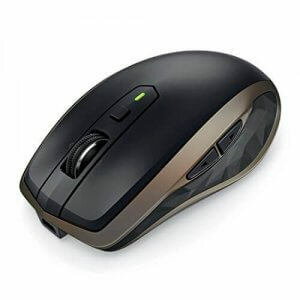 This surprisingly inexpensive optical mouse with IR light tracing technology which works on any surface. The energy saving with low power indicator means automatically turns off if it not used for 10 minutes. So, this mouse is highly recommended for heavy users. 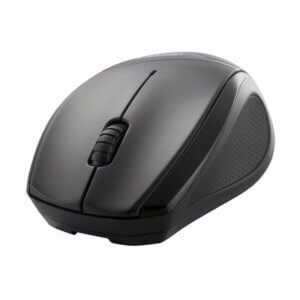 In addition, this mouse has an operating range of 10 m as well as three switchable DPI settings: 800/1200/1600. 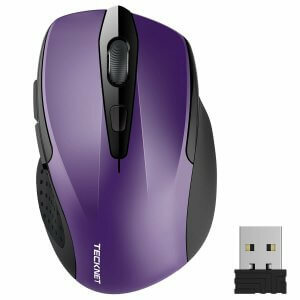 If you are not a heavy computer/mouse user but tired of having a wired mouse, this affordable mouse can be the starting wireless mouse for you. 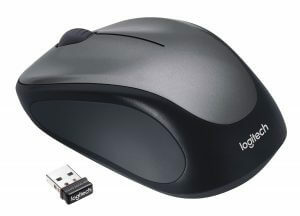 This top-selling wireless mouse from Logitech is a reliable companion to computer devices. The soft side grips and a comfortable shape make you feel good, even after long hours of use. This Logitech mouse is just amazing and very smooth to control. It works on glass and tile surfaces as well. Other features are operating distance is up to 10 meters, the clicking sound is on the quiet side. And oh, did I mention? It is pretty cheap! So, how was it? We have introduced our top 10 choices in wireless mice. Each one has its own unique qualities and specifications. It is not easy to choose the perfect one, but you might want to start with this article. Good luck!